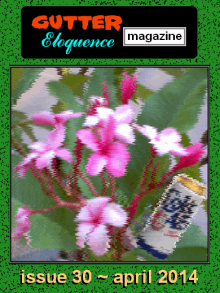 Gutter Eloquence is an online journal of free-verse poetry. The writers featured here will be real, gritty, gutsy, and unafraid to speak their minds. These poets are not one-dimensional, however. So, you'll sometimes see their bold individualism tempered by open vulnerability. We are, after all, human...even here in the gutter.